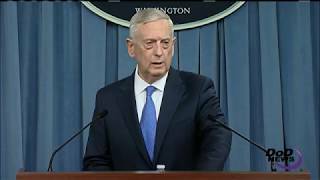 The U.S.-led coalition against the Islamic State of Iraq and Syria will continue to build on the progress made to date to accelerate the campaign to annihilate the vicious group wherever it tries to form, Defense Secretary Jim Mattis said during a Pentagon briefing today. Mattis was accompanied by Marine Corps Gen. Joe Dunford, the chairman of the Joint Chiefs of Staff. The terror group seemed to appear from nowhere two years ago and swept across Syria and Iraq, causing death and destruction wherever it touched. ISIS affiliates formed in Afghanistan and North Africa. And swarms of foreign fighters sought to reach Raqqa, Syria, the terror group’s self-styled capital. The United States is leading the campaign to defeat the terror group, and crush the idea that ISIS is invincible. Soon after taking office in January, Trump ordered a review of the effort against ISIS. Two changes came from that review: Delegation of authority to lower command levels, and the president directed a tactical shift from shoving ISIS out of safe locations in an attrition fight to surrounding the enemy in their strongholds, so we can annihilate ISIS,” Mattis said. All this was done with no change to the rules of engagement or changes in protecting innocent civilians caught in the fighting. It’s truly an international effort against the brutal group, Mattis said. “Since this began in 2014, the coalition has strengthened and expanded,” the secretary said. There are now 68 members in the counter-ISIS coalition, Mattis said. Those nations and affiliated organizations are sharing intelligence, providing troops and funds for combat and for the post-combat recovery. A total of 26 nations contribute more than 4,000 non-U.S. troops on the ground and in the air. This effort has “reduced ISIS-held territory, limited their freedom of movement, destroyed a great deal of their leadership, reduced the flow of foreign fighters into and from the region, diminished their financial resources and, I think, perhaps most importantly, we’ve undermined the credibility of their narrative that there is a physical caliphate in Iraq and Syria,” Dunford said. In Iraq, U.S. and coalition forces provide equipment and intelligence to Iraqi security forces, the chairman said. Coalition pilots bomb ISIS targets and coalition advisors work with Iraqi leaders on the campaign. But it is the Iraqis paying most of the cost, the general said. “In Mosul alone, they’ve suffered approximately 980 killed and over 6,000 wounded,” Dunford said of Iraqi losses in the fight against ISIS. 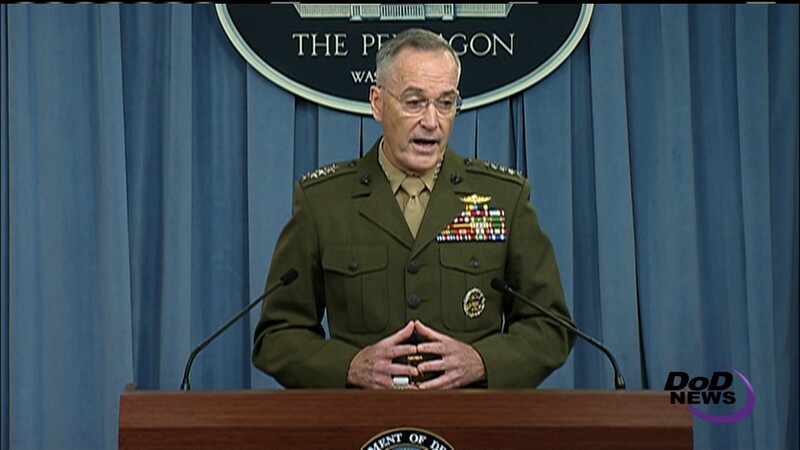 In Syria, working with Turkey and partnered forces, the coalition has sealed the Turkish-Syrian border, stemming the flow of foreign fighters, weapons and money to ISIS, Dunford said. The general said at its peak there were about 1,500 foreign fighters crossing that border each month. That has dropped to less than 100 today, he said. And Syrian Democratic Forces are isolating Raqqa -- the center of ISIS. This cooperation has enabled closer political coordination between local, regional and national governments to help return people to their homes after the battles are won through an innovative post-conflict approach based on empowering people at the local level to restore life to their communities, McGurk said. The effort is being led by Germany, Italy, France, the United Arab Emirates, Norway, the United Kingdom and other key contributors. The initial focus on de-mining key facilities is a critical coalition focus. “Iraqis, trained by our coalition supporting demining, have now cleared 34 tons of explosive material,” he said. In Iraq, 1.7 million Iraqis are now back in their homes, McGurk said.